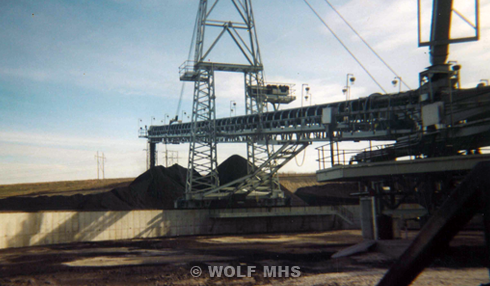 Wolf designs, fabricates and supplies custom designed Stackers that can be fixed or traveling. Each stacker is designed with the “complete system” philosophy, which takes into account material bulk density, topography, feed rate, accessibility, as well as many other factors. A flexible spout can be attached to minimize free falling material to eliminate dusting or the boom luffing ability can take the unit to within a few feet of grade. The Traveling Stacker can be mounted on rails or can be a rubber tire type design.